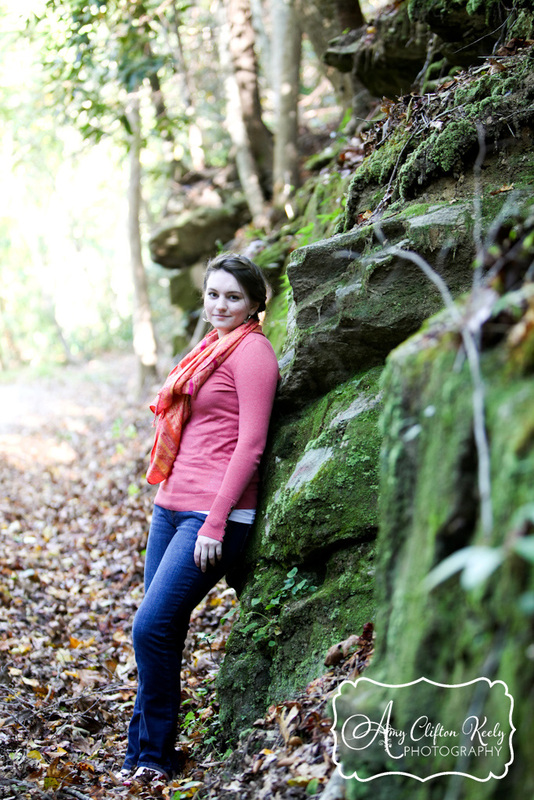 Alyssa asked me to photograph her Senior Portraits in an area that showcased the elegant beauty of nature, so we chose the texture, the history, the lovely wildness of Poinsett Bridge in northern Greenville County, SC. I cannot think of a better backdrop to photograph this high school senior. Alyssa has a quiet yet witty elegance about her, an “old soul,” a personality that so perfectly matches the juxtaposition of the weathered moss-covered stones and the softness of falling leaves. I met her and her sweet mother on a CHILLY fall afternoon to capture this young lady’s perfectly aloof model stare….and a few real smiles as well. I LOVE photographing teens and seniors–so much personality, so much emotion, so much to come in their lives! One of my favorites from the whole session. This look is perfectly Alyssa. After a quick wardrobe change, we moved across the street to the actual Poinsett Bridge. Alyssa’s family is one that I have so much respect for as I’ve gotten to know them over the years through her sister’s Senior Portraits and family portraits. This family is funny, caring, and loves the Lord. Alyssa, I LOVED photographing your senior session and I look forward to hearing of wonderful things from you throughout the years! Thanks so much for choosing me to document this special time in your life. If you would like to view all of Alyssa’s portrait gallery, please CLICK HERE. Password is her last name. Please click below to view a slideshow of Alyssa’s proofs, and as always, it is great to hear from you through the COMMENTS section below. Thanks for stopping by!